Testimonials are a great way to listen to other clients experience with Anna Banana. We have been blessed to have so many amazing clients, many of whom have been with us for well over 20+ years. Our clients aren’t just clients to us but rather they become like members of our family. We pride ourselves in going above and beyond to help each client either sell or buy a home(s) in the Metro Phoenix area. Our mission is to make each real estate transaction as smooth and stress-free as possible. I want to be your trusted real estate broker! Anna is a real trusted advisor in the real estate industry. She was extremely helpful when it came to giving me ideas about how to sell my house, including repainting some of the interior, staging for the right look, and presentation. Anna is very active, knowledgeable, and savvy about using the internet. She used the most up to date web info, blog, and industry info to sell my house. That alone will bring buyers to her to help sell your house- even finding potential clients from across the United States. There is no other realtor that can do what Anna does. I highly recommend Anna to be your realtor. She was the best and I won’t hesitate to refer her to other friends that want to move and help them find the right house! Anna is the greatest! Over the years she has helped me buy two homes and sell two. I wouldn’t think of calling any other realtor but her. She knew how to help me find just the right place, and when it came time to sell, she made everything so easy for me. She is a true leader in the field of real estate – extremely knowledgeable and organized, and super nice and fun as well. On my recommendation, Anna also helped my mom find a home, which she loves. Thank you Anna, for all you do! Anna took all the worry out of buying a home! She is terrific! Anna, was very helpful and very knowledgeable in helping us find a home when we moved to Phoenix from Ohio. She was a great asset to us in finding us the perfect house and then helping us buy another home. Anna “Banana” Kruchten has all the right moves to pull together…and hold together…any real estate transaction from a simple, cash purchase to a complicated short sale negotiation. As an escrow officer, I’ve seen her in action many times and have always been impressed with her knowledge and professionalism from the opening of escrow to closing day. I am REALTOR Emeritus and own a real estate school that does continuing education and training. We were fortunate to be referred to Anna to join us as an instructor in our school, due to her impeccable reputation and expertise. The feedback on Anna is so exciting-she has helped so many agents surpass their goals through her generosity in sharing with them. We are thrilled to be a colleague of Anna’s and to present her as the consummate professional that she is. Anna worked with us as we attempted to short sale our home. She came to the house and did a thorough review and provided a detailed list of recommendations to help our chances of selling quickly. We implemented all of them. Anna and her team too pictures and video of the inside and outside of the house and worked very hard to portray our home at it’s best. It was truly impressive how professional and focused Anna was with her follow through with us and the bank and everyone involved with the sale. It really set our minds at ease knowing we had Anna to guide us. We also worked with Anna to purchase our new home. I absolutely would recommend Anna Banana and the Phoenix Property Shoppe. I’ve purchased two homes now with Anna’s help and highly recommend her to anyone interested in buying a new or resale type home. The first home was in Goodyear and closed late September 2012. The second is in New River (Arroyo Norte subdivision off I17 and Anthem) and will close in June. We started looking at resales but ended up going with new home builders. She worked very hard for us and really earned her commission. Anna is simply a very positive high energy person. I have known her for decades and I would trust her with anything. I don’t think you could find a better realtor anywhere. She would be my first choice to buy or sell my home. When you think of someone with a lot of integrity, you think of Anna. She is also a very caring & compassionate person. Anna helped my son and daughter-in-law find their first home. Being first-time potential homeowners, they were not always sure of what they wanted. Anna was patient and understanding through a sometimes arduous process. Her knowledge and expertise, especially in the Moon Valley area and North Phoenix areas, are exceptional. Anna is one of those people who really means it when she says that the client’s needs come first. She helped me navigate through the rough waters of home-buying when the real estate bubble was at its peak. My offer was one of 6 the buyer had in the first few hours of listing and 15 more in the wings. When I got married two years later and decided to sell, Anna helped me navigate through the real estate crash scene. She guides with wisdom and experience but always allows you to make your own choices. After all, you have to live with them, not Anna. Wonderful service, wonderful lady with great personal and professional values. Anna rocks. Anna was a joy to work with. After finding me the home and negotiating in my favor, she was also able to help me with some decorating ideas as well as provide amazing referrals to get the house fixed up. Anna is of extremely high integrity and her positivity makes it a delight to do business with. The property that we purchased ended up being a rental, and Anna also helped us find OUTSTANDING tenants, She has been there for us all the way and I would recommend her to anybody that needs a TOP NOTCH agent. She is hard working , honest, knows her job, and stays abreast of the ever changing market. We love her and would, and have given her the highest of recommendations. We have now just sold the rental property through Anna (7/2016) and once again Anna surpassed our expectations and handled every detail for us as we live in another state. We are extremely happy with her service and impressed with her level of expertise – and her caring for us too. We would like to recommend Anna because she extremely helpful and knowledgeable.Very experienced, honest and enjoyable to work with. Fantastic agent/broker to work with, you can be assured all the details will be taken care of. Anna is most effectient at what she does. Highly recommend her to anyone. Anna Banana is wonderful and knows her “stuff” as they say very professional realtor honesty and integrity all the way, and made it so easy for us to get into this home and made sure we were getting all the best for us as far as costs and in a good area, she asked the questions and knew exactly what was best for us! Thanks Anna Banana! Anna “Banana” is fantastic. She has a fun, energetic personality, full of local knowledge and a genuine care and charisma for her clients. We highly recommend her for your real estate needs. Anna Banana provided a seamless, stress free experience. Her professionalism and knowledge helped us obtain the best deal! She has helped me buy and sell many homes over the years. I would recommend Anna for any real estate transaction. I would like to take a few moments to express my gratitude to who I consider to to be the best real estate agent. I made a decision to move to Phoenix to be closer to family. I would be relocating form out of state which raised some big concerns for me. Making the decision to fly to Phoenix and spend on week with Anna Banana was time well spent. After only 3 days I found my dream home. Anna had a wonderful system while searching for homes and it proved beneficial for me. I really didn’t know what to expect being new to AZ and I had so many questions. Working with Anna Banana was such a pleasurable and smooth experience. And she provided a lot of support for me. Thanks Anna Banana for making my experience a happy one! Anna “Banana”, You’re the BEST! We were thinking about moving for the last two years. One day we learned that our neighbors had sold their home and they were very happy with their realtor. We got in touch with their realtor, Anna, and she was vivacious, energetic and aggressive. We both liked her immediately. She sold our house to first day lookers for a better price than we had expected. She also referred us to an Independent Living place with a garage where we were able to get into right away. We closed escrow by the end of the month. She worked with us every step of the way. She is a great lady. My husband and I had been trying to purchase a new home for years. We had no luck with our previous agent. We were recommended to Anna Banana by a family member and were fortunate to have found her. She found our PERFECT home within the first month of searching. She understood what we wanted and made it happen for us. She is such a knowledgeable REALTOR with the contacts who know how to make everything run smoothly. We found our home, made an offer and closed within a month. All of our family has utilized Anna’s expertise and I wouldn’t dream of using anyone other agent but her. I recommend her to everyone that has an interest in buying or selling a home. My wife and I had bought houses before, but never in a market like this. Anna was wonderful. She explained everything in terms we could easily understand, was infinitely patient, helped us navigate through the new rules and regulations, and made sure we found that dream house we were looking for. Couldn’t ask for a better realtor. And on top of that, she was fun, cheerful and a joy to work with! I just wanted you let you know what a fantastic job Anna Banana has done for us over the years. We purchased our first home from her over 20 years ago! We were new to the Scottsdale area and Anna made sure it was going to be an excellent investment for us as well as a wonderful home. Now we’re getting ready to sell and buy again and we are working with Anna Banana because we know she have our wants and needs down to the nitty gritty! We are busy people that don’t want to worry about the details and it’s comforting to know that they take the stress out of selling and buying. You can count on Anna Banana to go over and above the call of duty and then some. What we don’t understand is how she gets it all accomplished and it appears to be effortless. We have referred many, many friends and associates to Anna Banana over the years. The feedback from all of them is what we expect from them……outstanding service, knowledgeable and very pleasant. That’s Anna Banana for sure….all that and more! My fiance Natty and I could not have been more pleased with the superb talents of Anna Banana. I was referred to Anna by my aunt who is a real estate agent in CA. We had just a few months to bring everything together – packing, moving, and most importantly the details for our upcoming wedding. We did not have the time or the resources to travel back and forth multiple times from Fresno to Phoenix… but we did not have to. Anna was able to recognize and pinpoint our particular wants and exact needs through a few phone calls and emails and turn them into reality. Anna tirelessly (and I might add, with a smile), drove us around Phoenix until we found the perfect home. She is a true professional. We are gracious for Anna Banana’s tremendous effort she put forth in bringing everything together. Anna just recently sold that home for us as we were transferred out of state. We will be returning in a few years and know we’ll hire Anna Banana to find us and our new baby another home. The Phoenix Property Shoppe happened along at just the right time in our life. My husband was ill and we had many properties to sell and we had to find a new home. 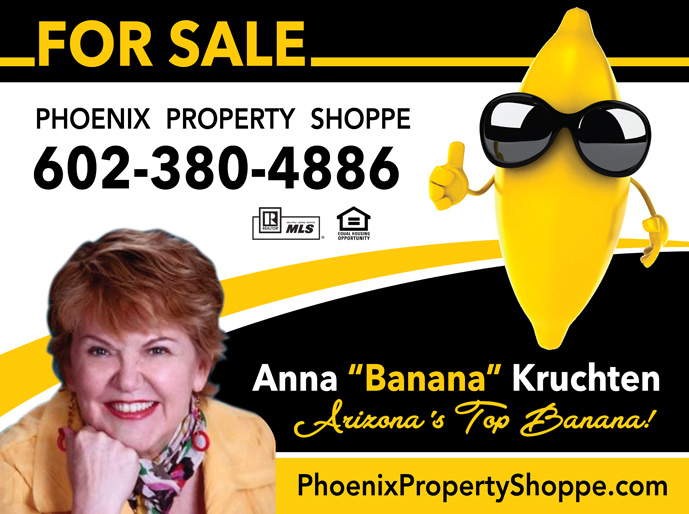 A friend said, “call Anna Banana, the owner of the Phoenix Property Shoppe, she’ll take good care of you.” Anna was so helpful and smart, not to mention supportive of our situation. She would come to visit just to say hi and see how my husband was doing. I couldn’t believe how smoothly every single sale went as well as the purchase of our new home. She and her associates even helped us move! Bless them all! The Phoenix Property Shoppe was referred to me when I was looking for a larger home. Admittedly, I initiated the process of selling and buying with foreboding. We looked at several homes and to my surprise the process was actually fun – due to my agent Anna Banana! She always arrived with a cheerful disposition and cold water (summer in Phoenix can be hot!). She knew what I was looking for in a home and how to interpret my needs. She led me through the process, advising me when I was unsure. I would recommend the Phoenix Property Shoppe team to anyone looking to buy or sell a home. Anna Banana, the Broker is very knowledgeable in her profession as are her team of professionals. She was a joy to work with and in the process has become a friend. Find Your Next Home With Our Amazing Property Search.